Dell’s Inspiron i3043-5000BLK is essentially a massive tablet that also doubles as a desktop computer. It packs a 19.5-inch display, 2.16-GHz Intel Pentium quad-core processor, 4GB of DDR3 RAM, 500GB HDD, Intel HD graphics, and a built-in lithium-ion battery pack. Aesthetically it’s sleek as well as stylish. Waves MaxxAudio speakers and built in sub-woofer ensure a immersive multimedia experience whether if it’s gaming or just watching internet videos. Product page. 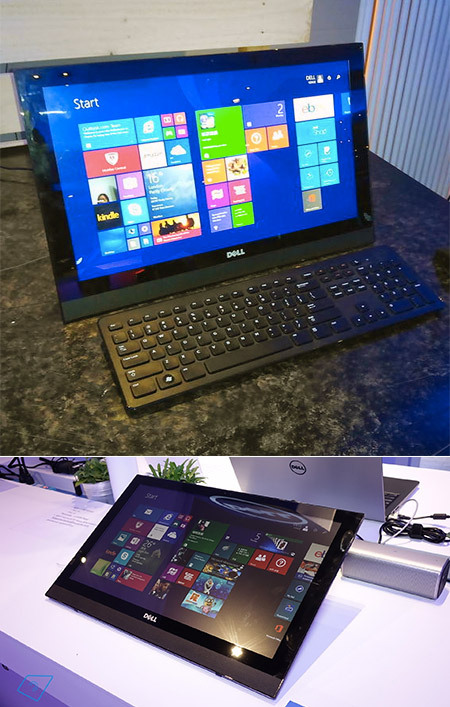 Continue reading for a hands-on video preview, more pictures and additional information.”Since it also has a built-in battery, you can pick up the Dell Inspiron 20 3000 Series desktop and move it from room to room, or lie it flat on your lap or a table for playing games, viewing maps, or doing whatever else you’d want to do on a relatively inexpensive 20 inch tablet,” says Liliputing. More information.